This forthcoming Saturday, at 9:47am, six mates and I will board the Greater Western Railway service at London Paddington station with beers, coffees and bacon sandwiches in tow, ready to pilgrimage west for the Wallabies’ annual victory over Wales. Upon arrival at Cardiff, we shall complete the most rudimentary of accommodation checks, dispose of our cumbersome luggage, and march to meet and revel with the antipodean diaspora, who will inevitably have conquered the hallowed drinking mile, St Mary st.
Litres of Brains, Guinness, Fosters, Heineken and Kronenburg will be consumed, banter will be thrown about with reckless abandon, some folks will fall by the wayside and not make kick-off. Speaking of making kick-off, the march from St Mary st to the resplendent spaceship known as the Millennium Stadium (what’s this ‘Principality Stadium’ nonsense?) takes all of five minutes, a victory for logical, sensible town planning, matched only by the twin religious monuments known as Caxton St and Lang Park. 5:15pm is when Bernard Foley or Dan Biggar will commence proceedings, and the 80 minutes thereafter will be a vitally important marker for both teams. 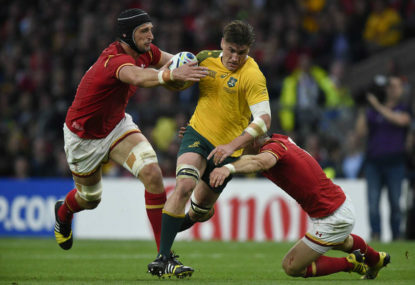 Wales will look to blow away the theory that they are vulnerable and tired after Lions tours, and Australia will be looking to build on their fantastic momentum from the New Zealand and Japan matches. It would help if they could recall the defensive wall from the 2015 World Cup group game against the men in red, memories of which keep me warm on these increasingly bitter autumnal Northern Hemisphere nights. This Wales team will be vastly improved compared to the one smashed by Australia in 2016, as not only will Warren Gatland be back in charge following his torturous, soul-destroying, how-did-he-survive stint as Lions coach in New Zealand, there are also minimal backline injury concerns (George North aside), which means the emergency crowd abuse magnet known as Alex Cuthbert need not be deployed. Don’t worry though Welsh fans, Rob Howley will still be there to soak up the punishment. Having made the trip to Cardiff twice previously – for the corresponding fixture in 2014 and a day at the Ashes in 2015 (spent at the gorgeous Sophia Gardens ground) – one thing that stood out for me is the sheer friendliness, sportsmanship and craic on show from the Welsh fans towards us Aussies. Perhaps it’s our shared dislike of the English sporting teams that unite the Aussies and Celts, not to mention our shared love of drinking industrial amounts of beer, as similar courtesies are extended in Scotland and Ireland. A Wallabies victory would only ratchet up the tension and stakes before the grudge match with ‘Fast’ Eddie Jones and the ‘Swing Low’ mob at Twickenham (funnily enough, another fantastic, pub-lined walk from train station to stadium). We have had the wood on Wales for nigh on a decade now, and although they will eventually beat us again, this weekend will not be the time. Our two greatest challenges this tour will be the aforementioned England game and the Scots at Murrayfield, which has developed into a nice little rivalry ever since Craig Joubert’s 100 per cent correct decision in the 2015 World Cup quarter-final. I could never dislike the land that gave the world Manic Street Preachers, Super Furry Animals and Stereophonics, therefore the craic will be shared liberally and the vibe will be ace – perfect for some Cardiff carnage.